I have my own little kitchen patrol troop at my house — my children. They’re good for so many things. They like to complain that they’re slaves. What about you? Do you have troops you can use to your advantage? If not, that’s OK. Do you have a spouse? Roommate? Or are you by yourself? It really doesn’t matter. The point is to either enlist the help of others, or break it down into small steps like I mentioned in THIS POST. So if you have your own troops, then by all means use them. Use them, but don’t abuse them! 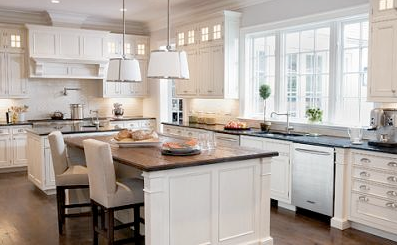 Assign each child/person a certain section of kitchen like the kitchen table, the stove, the counter, etc. For example: child #1 gathers all the plates, child #2 takes the cups, child #3 takes the silverware, etc. Someone loads the dishes, someone clears the table, someone puts the food away, someone sweeps, someone wipes down counters, etc. If you clean hard enough, your kitchen might look like this. Ha! Just joking. That’s what I want my kitchen to look like someday. This entry was posted in Cleaning, Organizing and tagged cleaning, kitchen. Bookmark the permalink. I can so see you in this kitchen.